There is a beautiful turquoise blue pond that became gradually popular by word of mouth over the last couple of years. 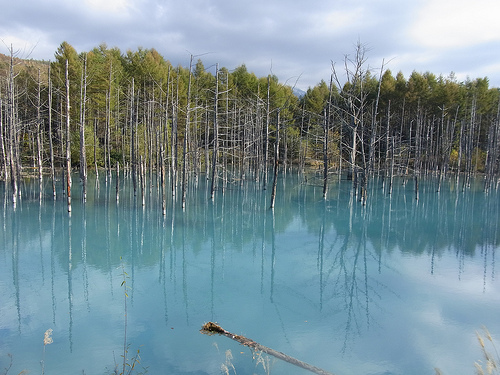 Simply called “Blue Pond,” the beautiful scenery with blasted larches standing in the turquoise blue water is seen in Biei, Hokkaido. The picturesque view was brought by natural phenomenon. In 1989, after an eruption of Mount Tokachi, Hokkaido Development Authority built a dike with concrete blocks to hold volcanic mudflow. As a result, water was stored in the dike. Why is it turquoise blue? Despite of water quality surveys, the answer is not made clear; however, one theory holds that the colloid made from aluminum containing water gushed out from Shirogane hot-spring district and the Biei River reflects the sunlight and makes the pond look blue. The Blue Pond is 18 km away from JR Biei Station and 7-minute walk from the parking lot. 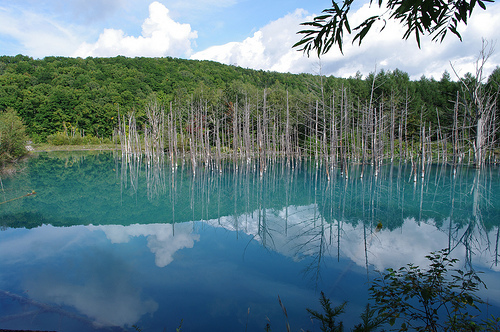 The journey to the pond takes long time but traveling through the nature of Hokkaido will be memorable experience.